Information about the Sage 50 Payroll software range is the RTI Edition (Real Time Information) watch the short video below to find out more about the software and how it can help your business. To see Sage 50 Payroll Auto Enrolment Edition videos click here. The latest version of Sage 50 Payroll software is now the Auto Enrolment Edition which has replaced the RTI Edition. 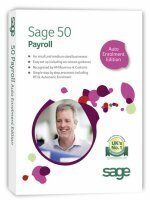 Order Sage 50 Payroll Auto Enrolment Edition online here or call your Sage Accountant Partner, Site4, on 01257 460018 to order today. At Site4 we have been selling, installing and maintaining Sage software for our clients across the UK's north west and further afield across the UK for many years. We are fully accredited authorised Sage 50 resellers and are an award winning Sage Accountants Club Accredited Partner. We can draw on over 20 years IT, accountancy and financial experience from our qualified staff and can provide on-site or remote ad-hoc Sage support. We also offer on-site Sage training across the UK as well as a range of Bite Size half day Sage training courses at our offices and the official Sage training products range.